It’s surprising it took this long to do a Tomb Raider reboot. While the series has had respectable entries as of late, its cultural relevancy died in 2003 after the critical and commercial failure of both The Cradle of Life and The Angel of Darkness. 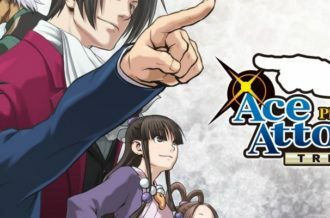 Not since the PlayStation era has a new entry felt like an event, but seventeen years since the series debuted, we’re once again collectively excited to step into the shoes of our favorite heroine. Instead of another subtitle, Eidos and Crystal Dynamics have reinvented the series by substituting the Lara long in the tooth (and short in the pants) with a gritty, realistic take on the character fitting of the new generation. While reboots often retain numerous elements of their forerunners, Tomb Raider couldn’t be farther removed from them. Nowhere is this more clear than the radical tonal shift of the series. 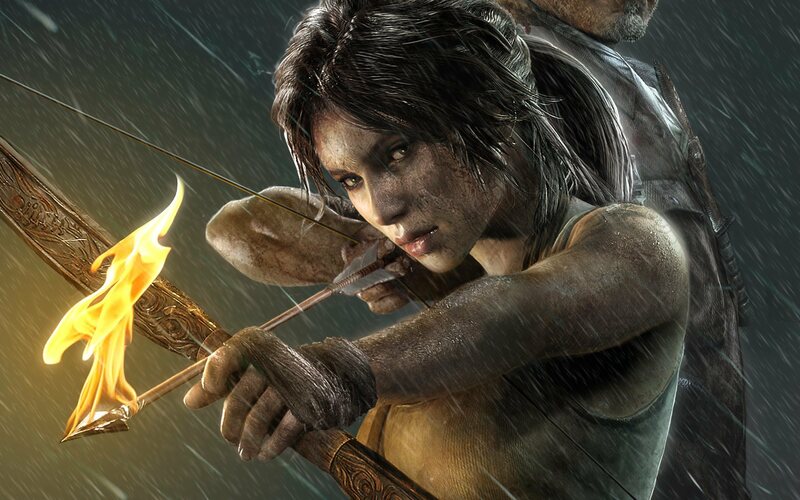 Instead of frolicking around a mansion, Lara sets off on the Endurance in search of the legendary island of Yamatai. Joining her is father figure and treasure hunter, Roth, friend and documentary filmmaker, Sam, and archaeologist and expedition financier, Whitman, along with the crew of the ship. After becoming caught up in a brutal storm in the Dragon’s Triangle, the team finds themselves on the island they were searching for after all — but with a wrecked ship and multiple injuries. Unfortunately, this is no tropical paradise, instead seething with dangerous obstacles including a radical cult trying to capture and possibly kill the island’s newest shipwrecked inhabitants. Rather than the confident adventurer we’re used to, Lara proves to be an uninitiated survivor thrust into the role of a reluctant hero. Instead of confidently jumping over obstacles and galavanting around the environment, Lara is at first wounded, weak and scared of her newfound desperate situation. She is, however, a strong and confident woman and soon gains the courage and experience to make it through the mysterious island in search of rescue. Much of the first half of the game is centered around Lara trying to signal for help and find her friends, but the deeper she ventures into the island, the less she can ignore the immediate dangerous posed by the evil cult of marooned survivors lead by the mad Mathias. Never before have the vulnerabilities of a lead video game character been as apparent as they are here. Even though Lara does begin to exemplify stunning acrobats around environments and a quick willingness to kill, there’s rarely a point in the proceedings where it feels like her survival is certain. Lara gets captured, beat up, falls off cliffs and makes mistakes — much like even the most prepared of us would do if forced into a unknown situation such as this. In one area, for instance, Lara falls into a river and gets violently tossed around until she crashes down into an abandoned World War II aircraft hanging off a waterfall. The cockpit windshield breaks under her weight, forcing her to parachute through a forest. Instead of flying to safety and moving on to more impossible stunts, Lara gets severely injured and is hampered throughout the next mission — the objective of which is to salvage medical supplies from a wrecked helicopter. Events like this throughout strike a balance between the required excitement and heroics of video games and the gritty realism so often lacking in them. 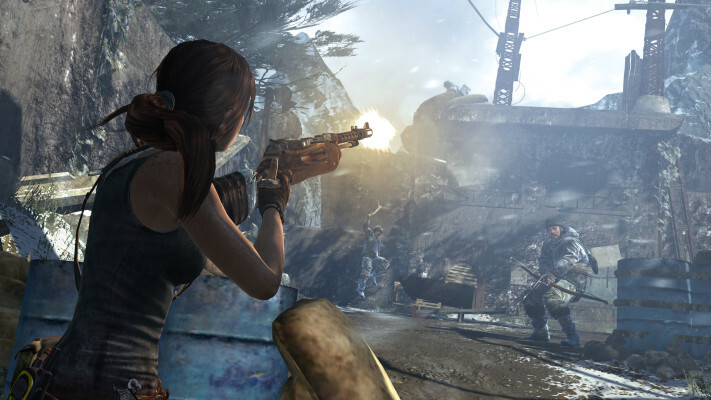 Of course, Lara is not helpless and often proves to be the aggressor thanks to multiple weapons found on the island. There are four basic weapons: longbow, pistol, machine gun and shotgun, each available in that order. Once acquired, they can be upgraded at base camps with salvage — both of which are scattered around the environment. Each weapon has multiple abilities that can be unlocked for it, ranging from damage increases to multiple modes of firing. Weapon Parts are then found that automatically upgrade their respective weapon type, like turning a WWII submachine gun into an assault rifle. Eventually, secondary weapons such as a grenade launcher for the machine gun can be unlocked. As many of the environments allow for stealth, however, Lara can sneak up on enemies with melee attacks instead of using a weapon at all. Stealth is preferable in most situations as it’s not only faster (enemies call for reinforcements when detected), but also more enjoyable. 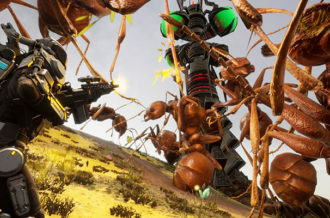 While weapons and combat are intuitive (thanks in part to intelligent AI), battles can sometimes drag on a bit too long and distract from exploring, which is where the game shines. Even though this is an action/adventure game set in a single environment, gameplay methods are constantly changing. Throughout the ten to fifteen hour campaign, you’ll experience things like climbing a radio tower, dodging a crashing jumbo jet and escaping a burning temple. Instead of reusing assets and gameplay dynamics, a common adventure game tactic, there’s not a single moment here that feels like filler. To appease long time fans of the series, there’s even optional tombs to raid that recall the puzzle solving and gameplay elements the series is known for. 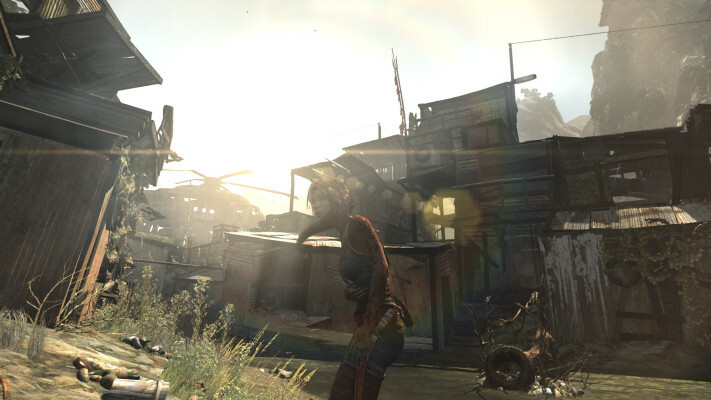 Further increasing its scope is the fact that it’s open world, allowing Lara to fast travel between camps in search of thousands of hidden collectibles. This isn’t Far Cry 3, however, and the game is (preferably) linear for the most part. Creative gameplay elements aren’t effective if they’re inside a mundane world, so it helps that Tomb Raider is visually ravishing. Outside of the stunning graphics, some of the best this generation, the island feels alive with gorgeous wildlife, ancient ruins and decaying relics of modern civilization. Be prepared to frequently stop in awe of a sunset or brooding storm, or the view from the aforementioned radio tower, which must be seen to be believed. Helping players appreciate this realistic environment is the impressive decision to not include a HUD. 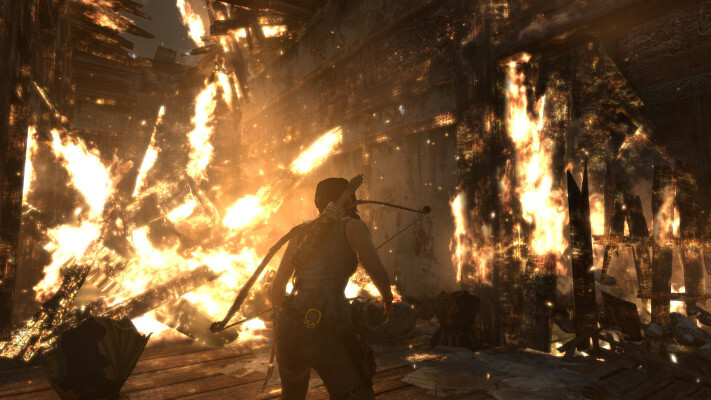 When Lara is traversing through environments, sneaking up on enemies or running away from one of many exploding bridges, the only thing visible is her and the surrounding environment. Vital information only shows up on screen when you’re aiming with a weapon, and even then it’s relegated to the top right corner. It’s a refreshing change of pace, as we don’t constantly need to be reminded of how many bullets we have left or hits until we’ll perish. If a game draws the player in, which this one certainly does, they’ll have a sense of how they’re fairing and where they need to go next without assistance of a bunch of cluttered junk on screen. If you do become lost, however, the click of a button brings up Survival Instinct, a black and white mode that highlights anything useful in the surrounding area. 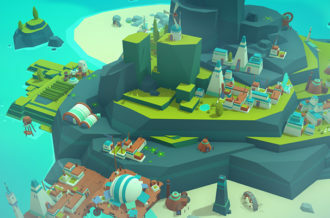 Besides the Objective Beacon showing where to go next, things like salvage, collectibles and interactive objects are shown. Standing still lets this mode last indefinitely, while moving makes it disappear in a few seconds (after all, who would want to play the entire game in black and white?). This mode is especially useful when trying to locate enemies or an animal to hunt. Unfortunately, the later isn’t especially useful in general, with animals randomly scattered around the environment doing little but granting a few points of XP for killing. When hunting is introduced, it’s as a necessary food source for Lara, but that dynamic is never expanded on. It’s too bad it’s not, as the mechanics are fine, but its futility makes it reek as something added in to cash in on the current archery trend. 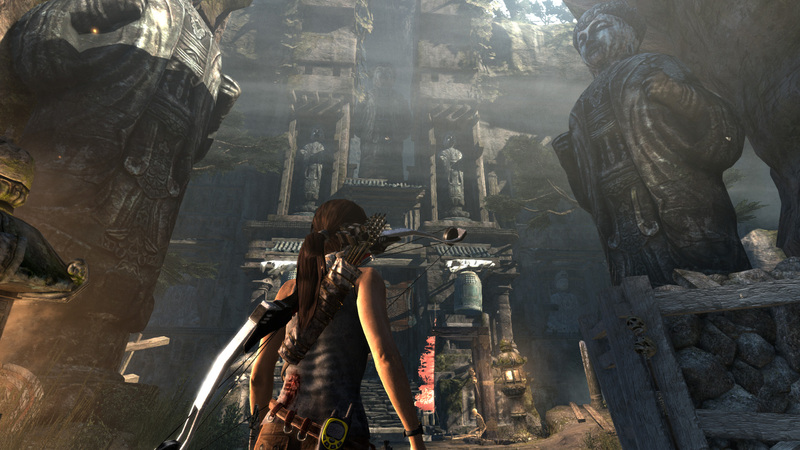 Tomb Raider is not just a reboot, but a revelation in a series that had long passed its prime. With cinematic camera angles, beautiful environments and the lack of a HUD, it’s visually ravishing throughout its meaty campaign. Add to that an engaging storyline plus inventive gameplay mechanics and this is not only the strongest Tomb Raider this generation, but also one of the best adventure games period. Even though archery is useless and combat can feel repetitive, the realism and grit of the experience make it hard to put the controller down. 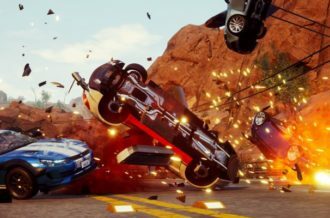 An open world, thousands of collectibles and enjoyable online multiplayer, however, make that notion near impossible. 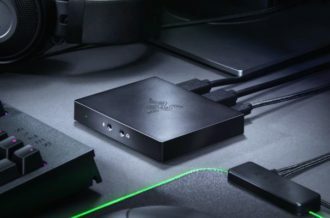 With the next console generation just around the corner, imagine what’s in store for us next if something this astounding can be done on seven-year old hardware.